This is a beautiful hand painted porcelain portrait brooch created by Fernand Paillet, for the Frederic Boucheron. 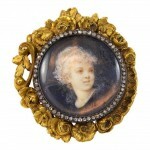 The portrait is surrounded by rose cut diamonds set in 18k yellow gold. Fernand Paillet (1850-1918), painted miniature portraits on enamel and porcelain, and also worked in aquarelle. His portrait sitters included Edith Wharton, the American novelist of the Belle Epoque. Paillet exhibited at the Salon de Paris 1873, and between 1879 and 1888 worked in the porcelain factory at Sevres. He was a miniature painter for the Parisian jeweler Boucheron, working very early in the Art Nouveau style.